Anthony DeAngelo buried a Craig Cunningham feed 3:16 into overtime Saturday night to lead the Roadrunners to a weekend sweep of the Ontario Reign, solidifying a 5-4 win at Tucson Arena. For the Roadrunners, the win expands room in the team’s sole possession of first place in the Pacific Division; they have earned points in all seven of their games (5-0-1-0) since their opening night loss in San Diego on October 14. The team’s knack for early struggles, however, returned Saturday evening when the Reign got on the board with a pair of quick goals in a 16 second span less than three minutes into the game, plotting an early two-goal deficit on the Roadrunners. Brendan Perlini, though, was up to the task. Midway through the first, while the Roadrunners were working on their first power play of the evening, Perlini shoveled home a rebound past Ontario’s Anders Lindback to get Tucson on the board. With just over five minutes to play in the opening frame, Perlini tied the game with his second goal of the night when he entered Ontario’s zone and fired a wristshot through the screen of a defenseman, handcuffing Lindback to record his fourth goal of the season. Tucson took their first lead of the night when Tyler Gaudet rushed up the right side, entered Ontario’s zone, and beat Lindback with a shot that squeaked through the netminder’s five hole. Ontario’s Paul LaDue answered midway through the second tying the game 3-3. During the final moments of the second period, Michael Bunting continued his hot streak when he drove wide into Ontario’s zone before firing a shot high past Lindback to give the Roadrunners a 4-3 lead. 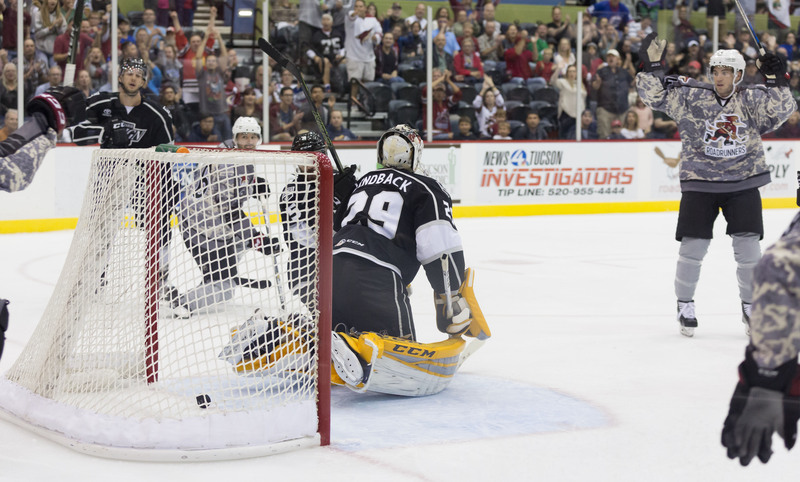 Adrian Kempe tied the game for the Reign with under seven minutes left in regulation time. The Roadrunners entered their third overtime game of the season. With under two minutes left to play in the extra frame, Craig Cunningham hopped on a blocked Reign shot in the Roadrunners zone, and flew through the neutral zone on a two-on-one with Anthony DeAngelo. Cunningham fed DeAngelo a cross-ice pass, who after taking time to settle the puck down and pick his spot, fired a wrist shot high to the near side to secure a 5-4 Roadrunners victory. 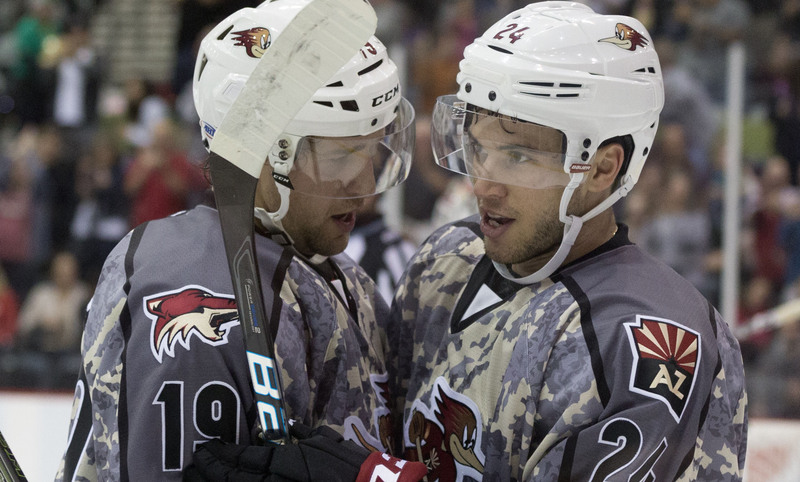 Brendan Perlini (2G) and Craig Cunningham (2A) led all Roadrunners players in points scored (2). Goaltender Adin Hill made 44 saves while recording his fifth win of the season.